Today PennEast published what it calls “minor” route changes along its preferred route. While certainly there are no earth-shattering, multi-mile changes, there are many little changes that can have big impacts on the region and on individuals. There are lots of little changes throughout the route, several new HDD sites in New Jersey, and there is much more detail available in the construction maps. PennEast characterizes the change as not additionally harming any landowners or environmentally sensitive areas, but this isn’t really true. There are actually lots of new harms, newly impacted landowners, additional impacts to wetlands, etc. This route change appears to be PennEast checking off boxes of minor asks from the various agencies about small issues along the route, without PennEast actually making any real substantial improvements. For example, here is the new map in the vicinity of the Swan Creek Reservoir. What this is showing is the previous route, shown in a hard to read light purple right through the middle of the map, and then the new route which is below that purple line. Note that this map is oriented with the pipeline going left-to-right, not North-South. North is actually to the left of this map, so if you mentally rotate it 90 degrees it may make more sense. Route 518 is to the right. This new map documents all the wetlands they’ll be going through on the site. Plus it very helpfully points out the existing 10″ water pipeline that feeds from the reservoir to the treatment area. And yes, they still show the construction breaking that line. The new construction is slightly west of the prior route, so they will be clear cutting even more than they were before, with more steeper slopes involved, more erosion, runoff, etc etc. On the bottom left you can see a house is now bracketed by the construction zone. 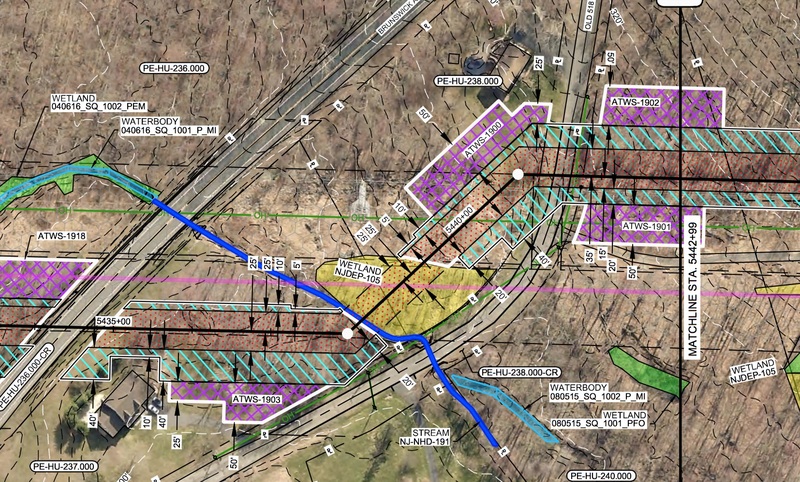 On the upper right, the route is now shifting east (paralleling Old Route 518 west now), with the construction zone bracketing that house a little bit as well. More maps and low-lights will be highlighted in upcoming posts from the route change. NOTE: I’ll be continuing to add files to the pipeinfo.org site. This is just one set!